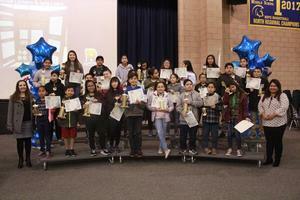 More than 100 students and their families attended the event, which honored students who placed first, second and third in their campus contests and awarded trophies to students who placed first, second and third in the District competition. Students stood beside their project poster boards and presented their hypotheses, research, data and results to their families, friends, teachers and passers-by. The event concluded with an awards ceremony, when students received a certificate for participation and a trophy for first, second or third place (See full list of winners below). Bassett Unified students received trophies for first, second and third place as well as awards in excellence for science projects relating to physical science, engineering, earth and environmental science, and math and computer science at the fourth annual District Science Fair on Feb. 21 at Torch Middle School’s Watanabe Center.